In this thread, new development of the Shuttle is announced and discussed. Feature requests can also be posted and discussed here. We can now i-load some parameters to loft the launch trajectory. There's a bias angle for the late stage-1 pitch angle, if that is positive the Shuttle will climb higher, if negative it'll reach ballistic arc-top earlier, and there's a bias for the path altitude. 1 deg in angle roughly corresponds to 7000 ft - I've done a test setting the climb angle 5 deg higher and the path bias to +35.000 ft and this worked like a charm. Why would we want to loft the trajectory? Generally it means more work is done by the MPS (if you have propellant to spare) because the periapsis will be higher as well - which decreases the OMS propellant need somewhat. The reverse is true for pushing the trajectory down - abort scenarios generally get better, but more work for the OMS later. I am trying that. If I understand well, the path altitude Bias is listed under trajectory loft? So if I want to finish around 360 kft at MECO ( shallower Loft like latest STS mission), I should enter something like that ? Edit: I got that, outstanding. Alarm and Klaxon linked to the F7 panel are really a huge addition for immersion, thanks guys. So you want also to dive into the R13 parameters thing? Not in the near future - if we expand CW, the CAM matrix is first on the list. Should we both change the SRB and Ballistic bias angle by the same value? or is it completely independant? Depends on what you need really. You can change the climbout angle during stage-1 which gives you a different arc top, or you can change the stage-2 attitude on the way to arc top - both work, but currently guidance tries to adjust the stage-2 angle based on the underspeed at SRB-sep (I'm kind of hoping to catch a few seconds of early manual SRB-sep that way, though I haven't tried such a scenario), so usually it should do what you need. After reaching arctop, the Shuttle flies managed vspeed essentially, but target vspeed depends on delta altitude, so if you only change the altitude, it'll fly up or down from whatever arctop is - which likely is a bit wasteful. Changing both SRB climbout angle and target alt in sync usually gives you a 'natural' trajectory more or less along the line. I thought I did that in the texture but see now that it is not controlled with the texture. Thorsten, all those labels have a material setting of yellow. Should that be changed to white in the initial blend and .ac? I also noticed the cw-light-fcs-saturation label had "Restrict Rendering" checked in Blender and thus is probably not in the .ac. Is that intentional? I don't know how they're done - ideally we'd have them light up in the correct color independent of external lighting - whatever accomplishes that is good. So all seems well with FCS saturation. Can you do the fire alarm sound as well? I pushed the freon-loop CW lamp fix, to "red" and verified the rest are correct with the text description. FYI: I have the materials set to red or yellow appropriately in the blend and .ac. 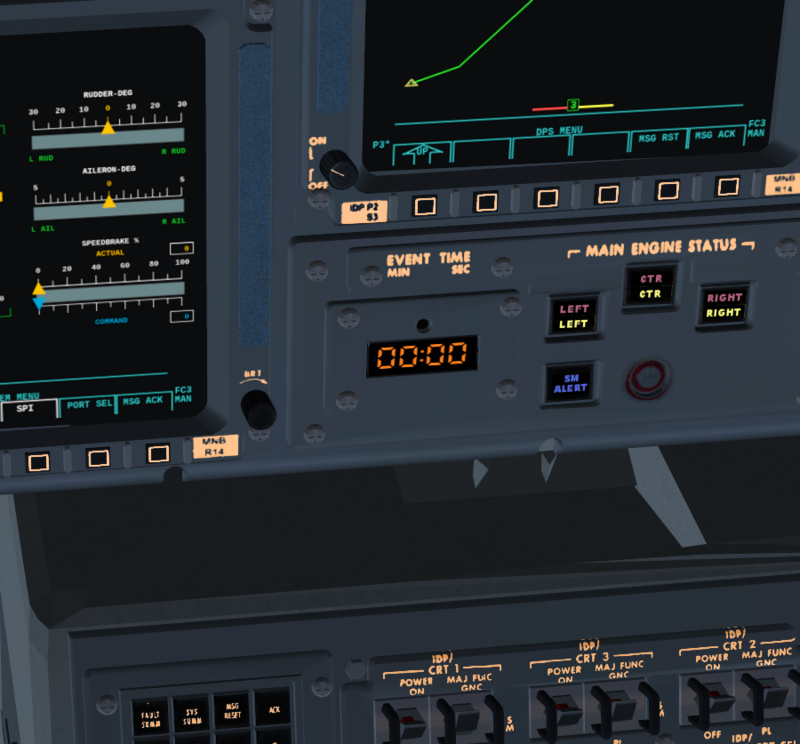 but don't think it really matters as we are changing them in cockpit.xml using a material animation. In fact the Red material setting was messed up and was actually yellow diffuse and specular. Do we know if the SM Alert lamp is blue label only or the entire button with white label like the Master Alarm? Are the red and yellow engine lights supposed to be in this configuration, both red and yellow lit up, at startup on the launchpad? I'm really not happy with the CW and MES lights. Try as I might using the material animation I can't get them to look at all like a real lamp. I think this will require a colored label texture or maybe even do it on canvas. I changed the color of the Master Alarm and I think it is a little bit better. Try as I might using the material animation I can't get them to look at all like a real lamp. I think this will require a colored label texture or maybe even do it on canvas. To the degree they're bright, a procedural light overlay might do miracles as well (it clearly did for our other lamps). Good idea. I did that to all the panel lights in the C172P with no ill effect. Ok, I'll give that a go.